Lock Poker is now holding satellites awarding seats into the International Stadiums Poker Tour. Day 1A of the 2013 ISPT took place already, on Sunday February 10th, but there are 5 more Day 1′s remaining, all on Sundays, all starting at 21:00 GMT. These Super Satellites award seats into one of two regular satellites: a $40 + $4 satellite at 20:00 GMT and a $10 rebuy satellite at 21:00 GMT. Several European poker sites host similar satellites awarding ISPT seats to players in certain countries, while Lock Poker is the exclusive U.S. facing poker site to award seats to American players in this big international event. These Day 1 events all take place online, with the rest of the International Stadiums Poker Tour finishing live at Wembley Stadium in London, England from May 31st thru June 5th. 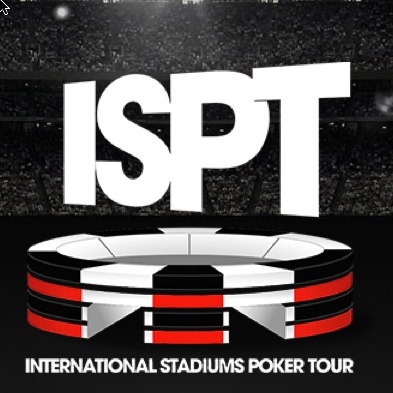 The ISPT will be broadcast live to over 38 different countries. Nearing the end of Day 1A the chip leader was Johnny N’Guyen, but it’s still so early it truly is anybody’s game. Nevada made gambling history when it passed a bill that makes it legal not only for residents of the state to play poker online but for Nevada players to play online poker at intrastate sites set up by other states to allow online poker within their borders. The bill was called AB114 and on Thursday, February 21, 2013 at 4:00 pm PST the Nevada legislature passed it unanimously, in both the state Senate and Assembly, and the state Republican Governor Brian Sandoval signed it into law. Sandoval also happened to be the Nevada Gaming Commission’s former chairman before taking the governor’s office. While the law does open the door for cooperation between states to allow interstate online poker and gambling between their borders, it still requires that individual states and Nevada set up those arrangements first. While the Justice Department has previously frowned on atempts to operate online gambling between state borders, the Nevada Governor plans to speak with the DOJ in the hopes of making the new law stick. The Nevada state legislature rushed the bill to a vote, declaring it an emergency measure for publicity reasons more than anything, as the state aimed to beat gambling rival New Jersey to the punch, as that state’s Republican Governor Chris Christie is expected to sign similar legislation in the coming week. 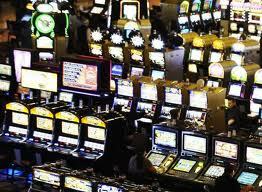 This keeps Nevada at the forefront of the United States gaming industry, online and off. The state is already alleged to have more than 20 online gaming operators and software and equipment providers seeking licenses to offer online gambling services under the new law. America’s Cardroom is now holding satellite tournaments into the upcoming Latin Series of Poker stop in Limia with a main event that boasts a $500,000 guaranteed prize pool. 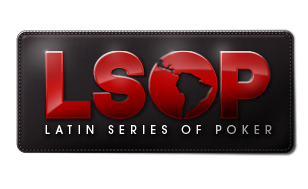 This latest LSOP event runs from May 20 to 25 and takes place at the Casino Atlantic City in Lima, Peru. Each America’s Cardroom LSOP Lima satellite winner will receive a prize package valued at $3,500 that includes that $1,650 buy-in for the main event, air-fare round trip for up to $800, a 6-night stay for two people at the Sol De Oro Hotel, including breakfast, Wi-Fi access, transportation roundtrip between airport and hotel, an invite for you and your guest to a welcome party, and a gift bag, a VIP support line available 24/7, and hotel taxes covered. For all of that, just win one of the 7 LSOP Lima Super Satellite tournaments taking place in the month of March 2013. They each run on a Saturday or Wednesday at 7:30 pm ET and award 1 prize package each. The direct buy-in is $140 + $12 but players can win their seats in these events instead through lower-cost satellites to the LSOP Lima event. These satellites cost $20 + $2 and run nightly between now and March 23 at 6:35 pm ET. At each of these Satellites, two seats in the next Super Satellite will be awarded. The Latin Series of Poker has been running for 10 years with the support of players from Americas Cardroom and a select few other poker sites. In addition to the main event at the LSOP Lima there will be many rewarding side events players can get in on as well, although at their own expense. This includes a Sit ‘n’ Go Race, a $300 event, and a High Roller event. Washington poker players were disappointed this week to learn that the latest bill aiming to legalize and regulate online poker has died in committee. The announcement came from the bill’s sponsor, Washington State Representative Paul Harris on Thursday, February 21, 2013 that the bill is officially dead for the duration of the year. He added, however, that he has been assured the bill will get a second hearing come the next session of the state congress. The House Government Accountability and Oversight Committee held a hearing on the bill that lasted nearly an hour before the decision was made to kill the bill for this year’s session due to too many questions raised during the hearing. The new legislation would soften the 2006 Unlawful Internet Gaming Enforcement Act (UIGEA) to turn recreational at-home online poker from a felongy into merely a class 3 civil infraction, the penalty for which, according to Washington law, is a maximum fine of $50 and something called “statutory assessments”. When asked why they should take the trouble of changing the current law if no one in the state has yet been arrested for playing online poker, Harris told the committee that his ultimate aim is to legalize online poker in the state but that he thought decriminalization was a reasonable first step to take toward that larger goal. Harris, who made a statement in his hearing that online poker could generate for state as much as $400 million, is still optimistic about this bill’s passage. 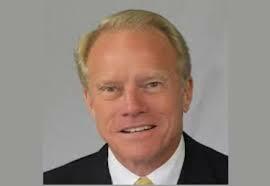 The Poker Players Alliance (PPA) is watching the developments on this story closely. With the first half of Bovada Poker’s two-part Black Diamond Poker Open behind us — the $150,000 guaranteed Contender Series — the second and much bigger half is just ahead — the $700,000 guaranteed Championship Series. 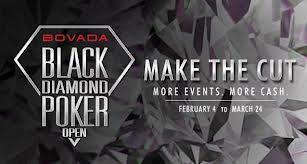 Bovada Poker’s 2nd Black Diamond Poker Open (or BDPO2) runs from March 10 to 24 and consists of 14 events in all different styles and variants of poker, including No Limit, Pot Limit and Fixed Limit; Hold’em, Omaha, and Stud; knockout, turbo, rebuy, and 6-handed events. Qualifiers into BDPO2 satellite tournaments cost as little as $1 + $0.10 to enter. The BDPO2 satellites themselves cost as little as $3 + $0.30 to enter. Just keep in mind that payers can only win a single entry into any given BDPO2 event and there’s no alternative value to redeem for additional satellite wins. And on Saturday, March 23, Bovada Poker holds Super Saturday Satellite Day with satellites into the Sunday, March 24 main event running all day long. That main event has a $425 + $25 buy-in and offers up a $250,000 guaranteed prize pool. On weekdays during the two-week series, Bovada Poker will hold three BDPO2 tournaments per day: at 9:02 am, 8:02 pm, and 10:02 pm. On weekends during this period, the site will hold 4 BDPO2 tournaments per day: at 10:02 am, 2:02 pm, 5:02 pm, and 8:02 pm. In addition to their cash prizes, all the winners of Bovada Poker Black Diamond Poker Open II tournaments will have their names posted on the website.